Have a question for Seb Coe? This is your chance to get answers from the main man behind the London 2012 Olympics. July 27 is a significant day for London: it marks one year until arguably the greatest spectacle in global sport takes place in the British capital. Beginning with the symbolic lighting of the flame, and enduring for 19 days until it is extinguished, nation will fight nation across 26 sports and 39 disciplines in pursuit of the coveted haul of gold medals on offer. The drama, emotion and enchantment of the Olympic Games is enough to capture imaginations across the planet as the story of athletic ambition unfolds. London will be the backdrop to an event which will undoubtedly test previous records as the most watched event of all time. 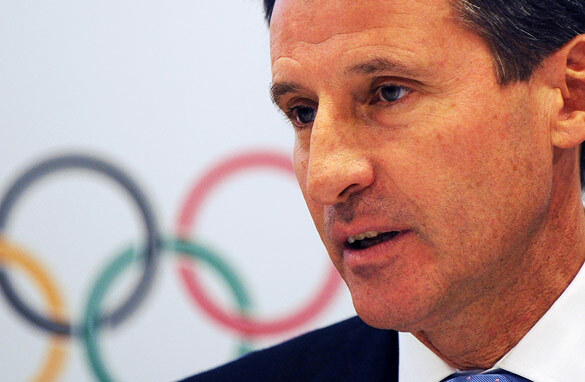 To be the man charged with delivering the Games to such high expectations is a role few would welcome and even fewer could pull off, but for Sebastian Coe - former 1,500-meter world record-holder, double Olympic gold medallist and British lawmaker - it is his day job. The 54-year-old, who led the successful bid which saw London chosen by the International Olympic Association (IOC) over Paris and Madrid as hosts, has been project-manager supreme preparing a sprawling city of millions to welcome the world in celebration of track and field. Challenges he has faced include the controversial ticketing system, the race to upgrade London's infrastructures and the daunting task of following the 2008 extravaganza put on by Beijing. CNN spoke to Coe on July 25 ahead of the "One year to go" countdown, and asked the 2012 chief some of your questions. Thank you to all those who responded. The interview will be shown on World Sport on Wednesday July 27. Are you sponsoring a Drawing wherein the winner receives an offer of 1 MIL for the selection of their email? Lord Coe, What a privalege to ask you a question. I'm wondering about the Olympic Marathon course and the challenges you faced with traffic. Your legend and stride inspired me, your pictures adorned my walls. London 2012 will do the same, I'm quite sure. As I fellow Sheffielder I am lost in admiration for the remarkable way you have organised so much rain to bed the Olympic turf in to perfection! I see you laid the last piece in the Spring : all it then needed is lots of rain. You must be delighted by the deluges so far, especially after all those promises of drought. More seriously, the Organising Committee has been quite brilliant in ensuring the main facilities are virtually complete a year and more ahead of the events. I had ma doots when my local MP Tessa Jowell here in Dulwich signed the contracts, but I have been proved wrong. Let's just hope you survive the nail-biting final run-in as well as you have survived so far. Why did you decide to pursue such a simplistic method for allocating tickets. My application was for around 40 tickets, and I got none. The bet high to win low tactic that people mentioned is a sign that you got it wrong. Something as simple as the ability to say I want to spend up to £1000, on the events in the following order: 1. 100m Mens Final, 2. Opening Ceremony 3. etc etc, would have ensure a much more even spread of tickets. Maybe your system was designed to recognize it would be far easier to quell the majority that didn't win than a minority that felt really hard done by. I didn't bother after the first round, as I have gone off London 2012, and now feel it should have gone to Paris. What a waste of my taxes. Thank you for giving me the opportunity to ask you a question Lord Coe. The rising cost of hosting an Olympic games has made it both a financial and economic risk for both the city and country that the games will be held in. In 2004, after the Athens games; many of the stadiums and venues went into disrepair and were abandoned. This caused many to question the financial benefit of hosting such an event after Athens and Greece were left "Holding the bag" so to say. How will the 2012 Olympics leave both a economic and infrastructural legacy in London for both her people, and the people of Great Britain? What does Lord Coe think about Lord Bates' Walk for Truce? Does he think a celebratory concert is in order? Mr. Coe is there in your view any lesson for aspiring managers and executives on the path through university and the strengths provided by a winning mentality and how they serve as a platform to motivate others. Skateboarding is considered between the third and sixth most popular sport in the world now. Why is it not being considered for inclusion in the Olympics? I've heard that it's not even going to be a demonstration sport. With BMX included, it would seem that at least one of the disciplines of skateboarding (vert, perhaps, since it is more disciplined and less subjective) would be considered on a trial basis. What is your opinion on that? I have been a massive Olympics fan my entire life. I shared the excitement when London was awarded the 2012 Olympics and have been counting the years, months and days until the grand Opening Ceremony. Sadly those feelings and that countdown no longer exist due to my extreme disappoint with the ticketing allocation fiasco. Like so many others, I applied for approximately £2000 worth of tickets. I checked my bank account daily hoping to see a deduction. No surprise, I got nothing in the lottery. As a result I no longer have any interest and plan to be away from London during next summer's games. How sad that a more equitable process couldn't have been implemented resulting in many more thousand local Olympic 'ambassadors' rather than 'new' detractors. i wanna know the proceedure involved in acquiring a ticket. Looking forward to seeing the London Olympics next year. I can not be there but i will be glued to the tv. and the question is : Will the most famous man in the United Kingdom be in the opening ceremony , mr James Bond. Thank you first of all, for all of your hard work in preparing London for what I am sure will be the finest Olympics yet! Secondly, my thanks to you for being such an inspiration to me as a runner and athlete. My question is what is the likelihood of Cross Country running returning to the Olympics in the near future, and would you be willing to help this come to about? Does Seb Coe have a clue about the shambolic process he has overseen for selling tickets for the event? It is a sick joke! Alright seb mate,here's my question my brother..... Do you think the money that's being wasted on the olympics would be better off spent on hospitals,homing the homeless,and feeding the starving. How much debt has been made to host 2012 olympics? I would like to ask about British teams in team sports. There are some problems or peculiarities because normally you have own teams for England, Scotland, Wales and the Northern Ireland. If I have understood right you have genuine British teams in basketball. But your football teams are really a team England although it´s official name is team Great Britain. Right? What about other team sports volleyball, handball, field hockey and water polo? Anyway let´s imagine that some Scottish football player would say that I wanna play in London Olympics if I am good enouhg player in couch opinion? I mean it might be a discrimination if (s)he couldn´t play only because (s)he is a Scottish. What kind of conversation there have been in Britain about this question? Given that it is easier for Britons to get the tickets that they actually want by going through a French website rather than the much-criticised British ballot system, has the organising committee sought to identify any similar problems looming for the Games in the near future? May God bless and help the man in sponsoring. Dear sir,i want to school in London but no access yet. The Olympics are a joke, starting with an organising committee who is supposed to deliver the ideals of the Olympic Movement, which includes upholding ethics in sport. When you hire people who have no personal ethics of their own, how can expect the organising committee to deliver on that? How do you rationalise to yourself, and to the tax payers, that you employ people who lie, cheat and live unethical lives? If you did any thorough background checks of your top staff, you would find, as I know from personal experience, that some of your staff have less than stellar pasts. The Olympic brand is holistic; you can't say you will deliver the supreme ideal when you are rotten on the inside. I believe that the London Olympic will be an extraordinary game, and colourful presentation. Preparing since how many years and 1 more year left to prepare usher perfection. Hopefully the London Games will be a lot more fun than this interview with their staid and guarded chief organiser. What a stiff! Give me his old track rival, Steve Ovett, any day, at least he had some personality. It didn't help that the interviewer pussyfooted around Lord Coe like his personal butler. Respect is one thing, but serving up softball questions, qualified by the fact that they were sent in by viewers, is lame enough, but then failing to press him with harder hitting follow-ups was cowardly. Ticketing issues? - "Tough luck." Transport worries? - "Too bad, dedal with it. "...Economic concerns –" Thank your lucky stars you're getting anything." Seb Coe is a politician and was allowed to give politicians answers that diplomatically told Londoners to shove it! I wouldn't have minded, but he couldn't even muster a smile while he did it. Poor show CNN, and Seb, I suggest you spend the final year before the Games in charm school. I am old fan of yours and gratulation with the work carried out in the olympic spirit. However you are being drowned in your old success. I went to Barcelona 1992 and spent a week and witrnessed horse jumping, basketball and the two last days on the stadium (with Carl Lewis etc) Great. We applied for tickets to horse jumping (one day) basketball (quarterfinals), track and field (3 days) To fill up the time we added two days of swimming. Total for two persons 3300 pounds. However we only got tickets for one day of the swimming. Nothing else. what the suprise and amaze show!!!! Hi. The Olympic Park looks amazing and I'd like to know how soon I can buy tickets, in advance of the Games, to go 'in' and see the place – canals, floral-areas, arenas & venues, etc.. How soon and how much? My question concerns the increasing size and costs of the olympics which preclude the games going to smaller nations. Why not split the games in four; winter, water, field, indoor and have a games every year. They would still rotate every 4 years but be slightly smaller, less costly and more specialist. Just a thought but unlikely to happen in what is left of my lifetime as I am somewhat ancient. Incidentally I live in Germany now but originate from Beffnal Green...what have you done with all those football pitches on Hackney Marshes?